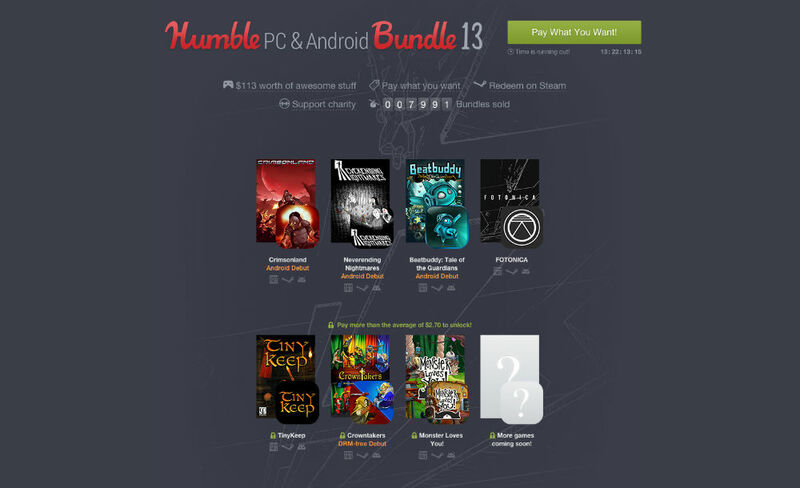 The latest Humble Bundle available is a mixture of PC and Android games, titled the Humble PC and Android Bundle. Inside, users who pay more than the average price — currently set at just $2.70 — receive seven playable titles on both desktops and Android devices. After about a week, more games will become playable as they are announced. For games, this collection is offering Crimsonland, Neverending Nightmares, Beatbuddy: Tale of the Guardians, FOTONICA, TinyKeep, Crowntakers, and Monster Loves You. In total, the collection is valued at over $100, all currently redeemable for a little under $3. And do note, you can have your money funneled directly to two different charities, the American Red Cross and Electronic Frontier Foundation. It’s a win-win. If the bundles feel good to you, follow the link below.